One Room Challenge - Week 7: Bedroom/Office Reveal! It's One Room Challenge guest participant reveal day and I'm so excited to share my finished principle bedroom/office with everyone! This is the room of my dreams and includes all of my favourite elements: a neutral backdrop, mix of vintage and antique pieces, original art and a pop of colour. Looking back seven weeks ago we were working with a builder's basic space including the original flat builder's paint from when we bought the house over five years ago. My jumping off point for the design was fabric. I wanted rich jewel toned velvets and creamy silks, linens and cotton - all of which had to play nicely with my absolute favourite fabric, Designer's Guild's Orangerie. Pink is my favourite colour and since this was a fall challenge I chose rich magenta and fuchsia tones as accents through flowers, pillows, art and the rug. I made the floral euro shams myself and enlisted the help of Willa Skye Home for the gorgeous Belgium velvet lumbar cover. Redesign is at the absolute core of everything I do and this room was no exception. Most of the main pieces in the room had a previous life and were well loved. My desk was my Nanny Lillian's dining room table, my dresser belonged to my Grannie Audrey, my nightstands were small dressers from our Habitat for Humanity ReStore, the vintage lamps were under $16 for the pair from Value Village, the rug was a lucky Instagram auction win and the headboard was a Kijiji find. Many other pieces are from garage sales, antique stores and markets and from family and friends. These pieces add soul to the room and achieve a look that has been pulled together over time. My desk chair was a find at the Christie Antique & Vintage show earlier this spring. I wasn't sure where I was going to put it when I bought it but it was the perfect fit with my desk, has great back support and is so comfortable. 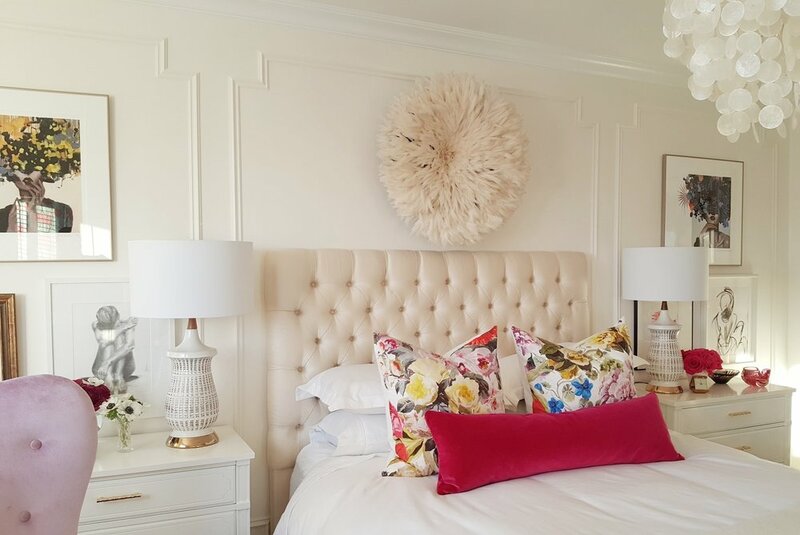 The soft pink lamp is a Kate Spade design found at Homesense as was the lucite chair. My children Matthew and Lily and I often work on school projects at the computer so the extra chair is really helpful and virtually disappears when not in use. Our DIY clay leaf trinket holders that the kids and I made add a personal touch to the room and are really useful in corralling earrings on my dresser. I updated my Kijiji find secretary desk that my Dad bought me with Farrow & Ball's "Hornbeam" wallpaper. It now fits with the rest of the room and provides both pretty and functional storage for office supplies and books from my favourite bookstore, Manticore Books. I wrote an entire post about the art featured in my room a few weeks ago by amazingly talented artists Anna Kincaide, Lynne Millar, Melanie Morris, Sandra Bell, Ingrid Seyffer, Allison Hobbs, Reina Donnelly and of course my daughter Lily. I hung Lily's pastel drawing on my closet door and it is the first thing I see when I wake up and the last thing I see when I close my eyes at night. This room really is about family. I had the privilege of working with my brother Paul on the construction of the room and am so thankful for his ideas, talent and attention to detail. My furniture was once owned by relatives I have loved and lost and were given to me by my parents who cared for them before me. All of the art by Anna Kincaide is also featured in my sister Erin's home as we both love her work so much. I have featured pieces created by my children and best friend Sandra Bell who is like a sister to me. This is the place where bedtime stories happen, where children come to snuggle in the middle of the night and where we sleep in as long as we can on Saturday mornings in the winter. This is the place where we research information on alligators, renewable energy and how to make slime. This is a place for family. I hope you love this space as much as I loved creating it :) Please also take a look at the other amazing spaces created by so many talented featured and guest participants. Special thank you to the amazing and incredibly organized Linda from Calling it Home for creating this forum for all of us to share our work and encourage each other.